As a flat footed teeth grinder I take note when my yoga practice helps me turn things around. Quite a few astute teachers have taught me that foot alignment while performing asana can have a profound impact on the rest of the body. When I’m consciously working the subtleties of my feet I actually do feel it all the way up to my jaw. But like most things, when I commit to doing them I go whole hog and don’t turn back. This week in classes I’ve been trying to get students on the fancy footwork bus too. In each and every pose it’s been root of the big toe and inner heel this, little toe metatarsal that. I’m completely aware that many of you are divided into camp one What the Hell Are You Talking About? camp and camp two My Mind is Blown: Life-Changing Yoga Rules. Which is why I really had to hone in on just the foot cues- through repetition you’ll learn and through repetition a transformation may take place. Wait…are we talking knees now? With the body being a tapestry or woven web of intricacies, when you pull on one thread the rest starts to unravel too. Your feet and knees work in concert with your thighs, your pelvis, your spine, your jaw, and your skull, etc. Hmmph. That’s a lot of parts. Good thing in class we just thought about our feet. Hopefully through diligent work the rest of you fell into better placement. Which leads us to considering the interrelationship of fascia and tensegrity. Fascia is a sheath of tissue that encases our muscles and organs. It’s the tapestry or web I’m referring to. Tensegrity can be applied in architecture or anatomy and simply refers to a structure that stabilizes itself mechanically because of tensional and compressive forces being distributed and balanced. When the fascia in your feet is made more elastic it not only releases tension in the foot but ripples through the whole fascial network within your entire structure. See this video. The length and width help to create space within the foot. The rooting is to help distribute the weight in a harmonious way. Given our individual prone tendencies one must practice these actions in a strategic way to optimize the work to suit our needs. Do you have a pronated foot? This is when the inner arches collapse and you have a flat foot coupled with a lift of the outer heel. Here I’d suggest to root the triangle of the foot more. Start by lifting and spreading the toes. Press firmly down through the base of the big toe metatarsal (ball mound/root of big toe) and reach back to the point on the inner heel. Then reach wide from rooted big toe across to the little toe metatarsal. There should then be a balance of weight across these three points. Initially having the toes lifted helps build the arches and root even but we eventually want to have the toes down and the arches staying up. Bunions? Do the same for a flat foot but really widen your big and little toes away from each other. Massaging the bottom of the foot, releasing the myofacia that is contracted, is huge help. In your yoga reach your big toe head away from the center of the foot while working your arches. Have a pronounced medial arch? Do you drop your weight to the outer edge of the foot thereby creating a narrowing to the bottom of the foot and a stress on the outer ankle? Congrats! You have a supinated foot or what I like to call crimp foot (think 80s hair). 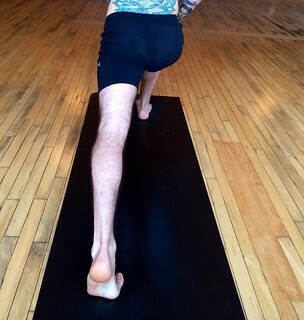 Your work is to lengthen and root the inner points of the foot triangle. Press firmly through the big toe ball mound and lengthen back to the inner heel. With feet parallel bend your knees and reach under and grab the metatarsals on your right foot. Pull them away from the arch towards your toes thereby lengthening the front of the foot and set back down. Then reach under and pull the skin on the bottom of your heel back and away from the arch, lengthening the back of the foot. Repeat on left side. Stand back up. Firmly root the ball of the big toe, reach back to the inner heel. From the rooted big toe stretch wide across to the base of the little toe and press down firmly. Lift your toes, widen apart as if trying to get your big toes to touch. Stretch them away from the foot as you set them down with a soft power (no gripping of toe tips). Poses where the front knee is bent (like virabhadrasana I and II, high lunge, parsvakonasana, etc) the weight will rock towards the front foot and your toes will grip the mat. Spread’em. Soft power. Toes gripping mat, weight falling into toes. Toes are spread wide, long and weight has moved into the foot triangle. 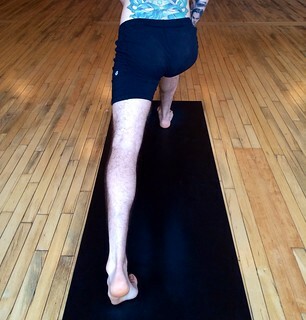 Back foot in standing poses will help the hips open via the turn of the thigh. You also have a chance to strengthen the ankle. The back foot in a standing pose can be up on the ball mound like a high lunge or down on the floor like in Trikonasana, etc. The actions are very much the same. Try this: press down through the big toe ball mound, stretch the inner heel back and down, then reach across to the base of the little toe. As you reach the inner heel back feel how the inner thigh turns back and the top of the back of the thigh broadens. To balance the action, see how when you bridge across to the base of the little toe the outer thigh moves back to. Watch out if your ankles are flexible. You might get light on the big toe and flatten the lateral arch of the foot into the mat, bowing the ankle out. That’s why the focus on the 3 points on the bottom of the foot can be most optimal over the four corner approach. See photos. Back Foot Set 1: A lunge foot here shown in a high lunge but also applicable to low lunges or anytime the heel is up and ball mound is making contact with the mat. Bottom of the foot here is narrow, outer ankle bowing out, thigh more turned out and narrow at the top of the thigh. Pretty good work here. Inner heel is reaching back, weight is balanced across the metatarsals so the ankle looks even on both sides, thigh turned in and broad across the back top of the thigh. Back Foot Set 2: Shown is Prasarita Padottadasana but could also be the back foot for any other standing pose. Even if the back foot was turned in more the tendencies and remedies would be the same for folks who drop weight to outer edge of foot. Weight is on outer foot bowing outer ankle, toes crimping, pronounced inner arch. Toes long and wide, weight across the foot triangle, stable ankle. Back Foot that is not shown is when we drop to inner arch and pick up the lateral arch. This happens often in Parvritta Parsvakonasana and Parvritta Trikonasana. See “Try this…” up above. 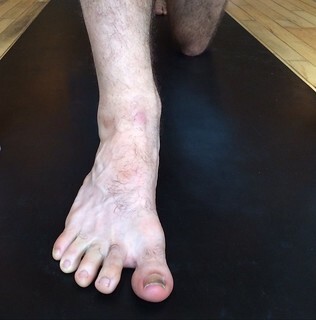 In Uttanasana many flexible students weigh their heels down and let the top of the shin bow back. Keep weight in your heel but also firmly press into the metatarsals, engage the arches and spread the toes wide. Well, you aren’t standing on your feet but your feet affect your thighs and your thighs govern the health of the low back. So watch for crimp foot- toes curling in, ankles sickled, weighing down on the top of the big toe side of the foot and bottom of the foot shortening and narrowing. Do stretch the inner heel back, reach your little toe to the ground and turn onto the center top of foot. In the end the center of your heel faces straight up, your ball mound is wide and toenails are pressing wide. Weight is on the top of the big toe side of foot, inner heel pulled in, bottom of foot more narrow. If you could see the thighs they’d be turned out just like the misaligned high lunge pictured above. Thigh is too turned in and ankles bow out, zero width and length through toes. Hard work to achieve but this picture displays pretty balanced actions. Notice how heel points directly up and weight is on center of top of foot, toes are spread and lengthening. See Bhujangasana. Crimp foot happens here too and now the grip of your hand on the ankle and outer foot can make it worse. You’ve been around the yoga block a few times and are privy to the notion that feet and thighs turn out in theses poses, shortening the low back. So make sure you are starting with feet parallel. Swipe your inner heels back, lengthening the inner foot, like you are trying to drag your mat. Watch out that you don’t grip the mat with your toes (inducing crimp foot). If you perform the postures with your heels up (to open your upper back) make sure to sweep the inner heel back and sink the inner thigh down. Examples below can be applied to the feet and thighs of either setu bandha or urdva D. Regardless if the heels are up or down, the inner heel should move back toward the head and equal reach through the 3 points of the foot triangle. Watch out for chronic toe flexion (looks like toes are about to pop off your foot). Work with soft power. Meaning that your toes are spread but they are reaching long, pointing straight up rather than pointing at you. Are you grasping your big toes? Cool. Just be sure to reach the medial edge of the foot forward so the gripping of your big toes doesn’t sickle the ankle. There are so many more poses and so many more weird things your feet will do! I’ll see you in class to cover the rest.